Yet another weak point in the DeLorean’s electrical system is, well, almost all its grounds. In normal cars it’s common to ground everything directly to the metal body of the car, because it’s convenient and it’s everywhere. However because the DeLorean’s body is mostly non-conductive fibreglass, return wires have to be laid to act as grounds. And for reasons of cost cutting, many of these return ground wires are considered by most owners to be only barely adequate. In fact, aside from the cooling fans, almost everything electrical forwards of the rear engine bulkhead all goes back to just seven undersized wires, which all go through a single unreliable bulkhead bolt, which goes through a single cable back to the frame. That’s not a joke – both low-beam and high-beam front headlights, all the rear brake/indicator/park/reversing lights, the air conditioner blower fan, the fuel pump, the electrical compartment’s relays, ignition/idle ECU, the radio, it all shares the same grounding path & few wires. Including the dash and the voltage gauge on the dash – and it should be pretty obvious how this impacts the voltage gauge’s accuracy, along with all the other gauges in the instrument cluster too! 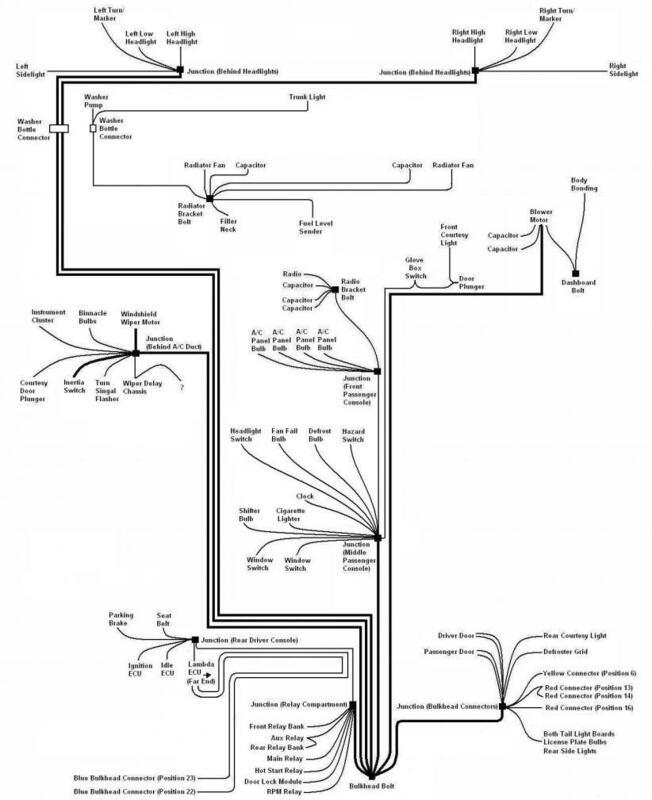 A diagram of most of the DeLorean’s grounding wire locations, courtesy Ron on DMCTalk – all these devices, only seven return wires, all connected to only one bulkhead bolt! 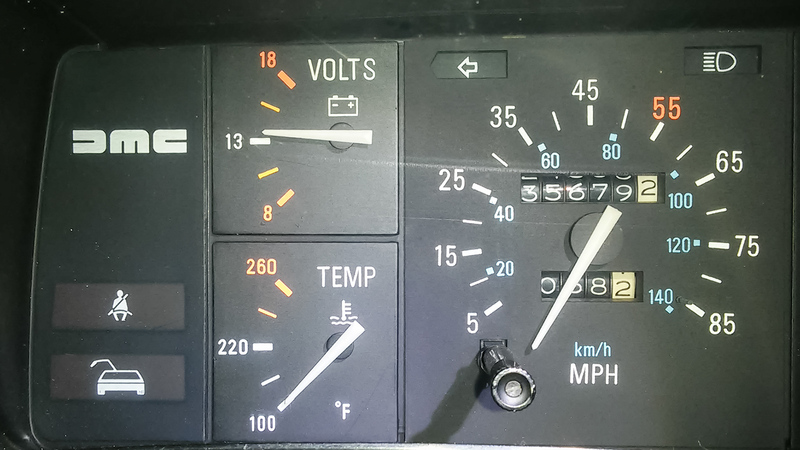 Continuing my recent electrical work, I wanted to see if I could make my dash’s voltage gauge a little more accurate. Also, a few of my other gauges are also a little inaccurate, all in ways that would be symptoms of receiving slightly lower voltage, and fixing the voltage issue should theoretically fix the calibration issues on all of them at the same time. I’ve been trying to improve the car’s voltage for a while now and it’s certainly better than it was, but I haven’t quite gotten it to where I want it yet. Even in the best-case scenario with a fully pre-charged battery in a running car that had been for a short drive with minimum electrical draw, the dash gauge would still only show apparently ~13.1V – almost a volt and a half lost from the 14.46V I measured from the battery. Given that I’ve cleaned the bulkhead bolt thoroughly & recently, I have Hervey’s upgraded double battery cable and I’ve minimised the power consumption in many other areas in my car through other mods/upgrades, I think it should be reading a little higher than it is. The dash shares its ground line with the fuel pump, which is a constant 7-8 Amp load. 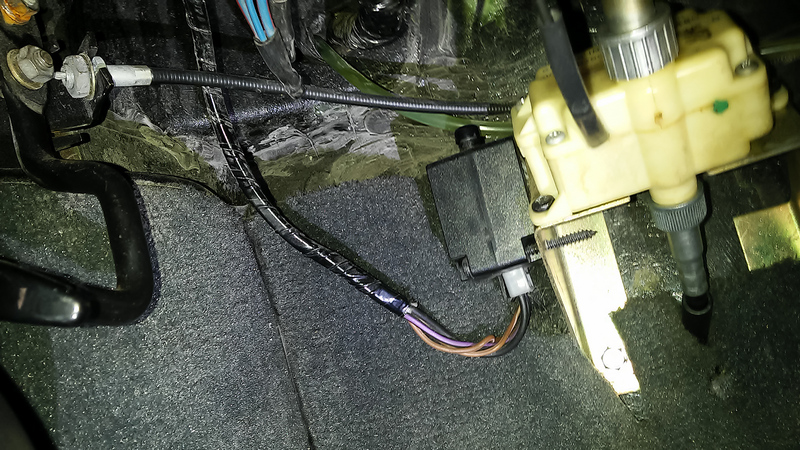 With the thin grounding wires in this car that’s certain to cause a voltage drop. Re-grounding the fuel pump is another common DeLorean mod, so that’s what I’m doing here today! The best place to do this with the least effort without bypassing any important safety features is right after the Inertia Switch, which is located in the foot-well of the driver’s seat (or, because I have a right-hand-drive DeLorean, the foot-well of the passenger’s seat – either way it’s the foot-well on the left side of the car). Depending on the DeLorean’s manufacture date (and if it’s had all the recall notices applied), the Inertia Switch will either be located on the left fibreglass wall of the foot-well or it’ll be attached to the Service Interval Counter. The thicker black wire entering it is the ground wire. Because of my RHD conversion it’s a bit easier for me to gain access & photograph these areas than it is for the average DeLorean owner, so this post will be full of photos! The best place to re-ground this wire is to the frame bolt in the right of the foot-well. 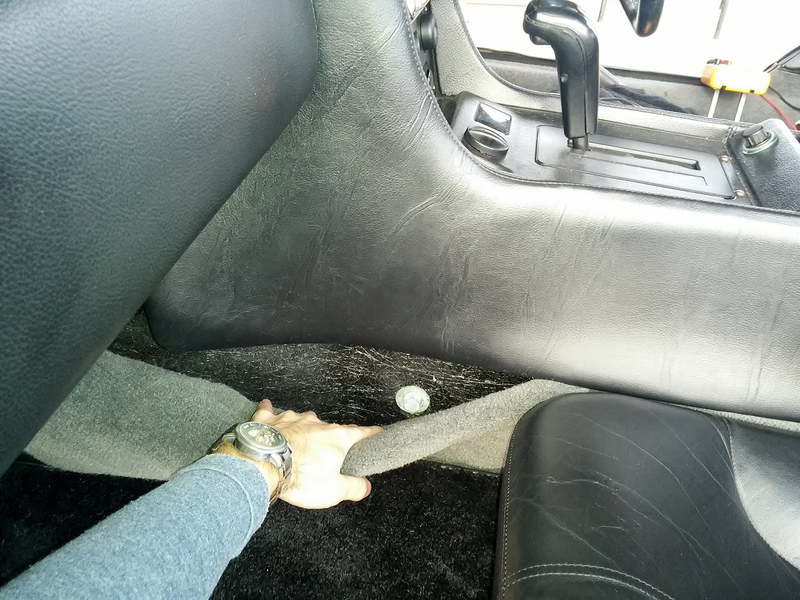 You shouldn’t even need to remove the centre console to access this bolt; just slide the carpet down (not by pulling out towards you, slide it down towards the floor) and you should be able to reach it. This goes right to the steel under-frame, which has a very thick cable connecting it straight to the battery, so it’s a good solid connection point. It’s a pretty simple process to splice in a new wire here. I used 15-Amp/16AWG wire because it was the thickest I had on hand and I considered the voltage drop over this small distance acceptable (it’s still well less than stock). I’m a big fan of over-doing connections in this car so the connectors were crimped, soldered and then heat-shrinked. It’s very possible to get away with doing only one wire on the half that’s connected to the Inertia Switch (and many would say that’s a better choice since it avoids adding a ground loop), but I opted to connect both halves of this wire to the new ground point, just to make sure my dash would always be properly grounded through redundant grounds. 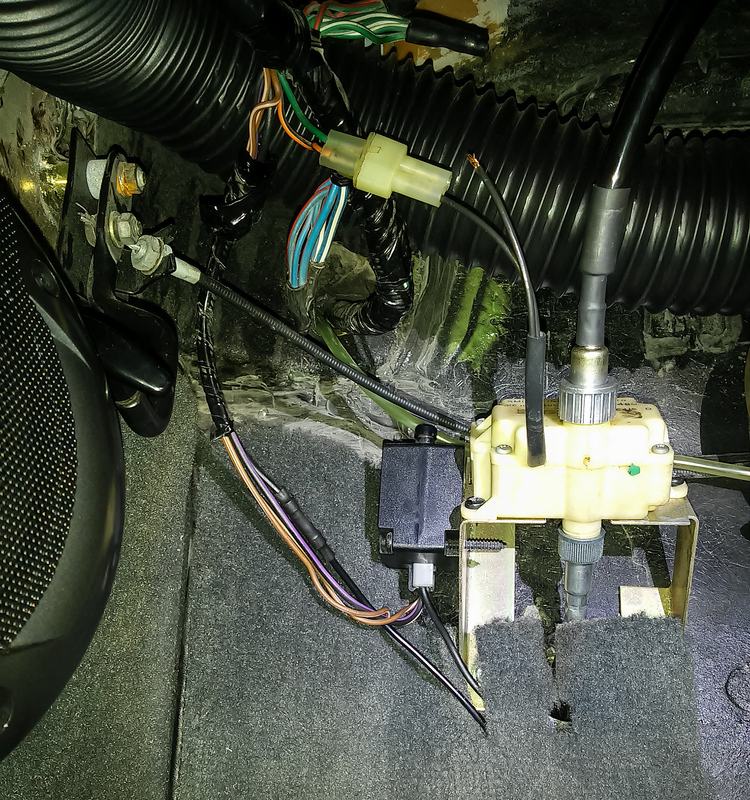 New wires spliced in place, while I show off just how much room I have in this area thanks to my car’s RHD conversion… And yes one of the wires from my service interval counter has come out of its plug – a future fix-it job for me! On the other end of this new connection, the bolt & washer was cleaned with a wire brush and a thin layer of conductive carbon grease was applied. You can use 10.5mm (3/8″) ring terminals on this bolt, but I opted for 13mm (1/2″) ring terminals because they still fit perfectly with the washers etc and my 13mm rings had a larger contact area on them to make a better connection. 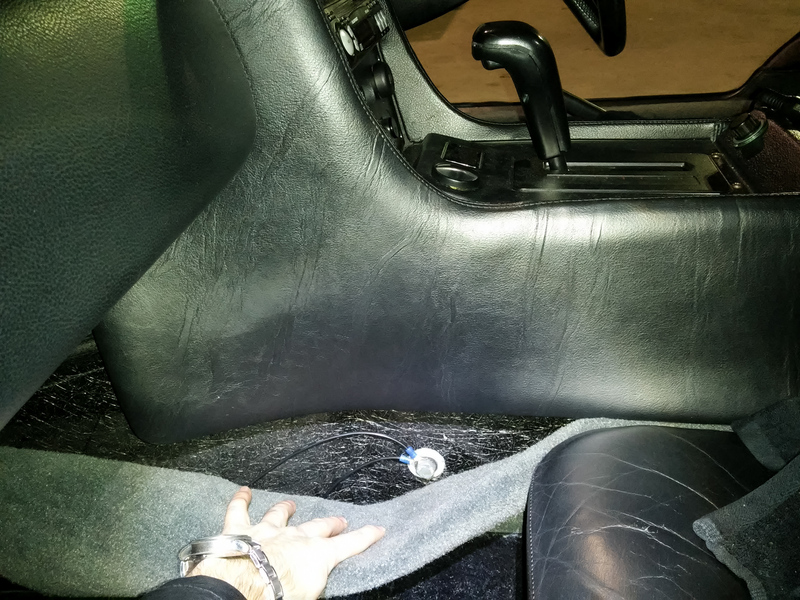 With that all done I pushed the carpet back in place, started the car, waited a few minutes for the alternator to recharge the battery to full, checked the dash, aaaaaaand….. Darnit. It’s reading around 13.2 Volts, a whole 0.1V higher than before, if that. It’s hardly moved! 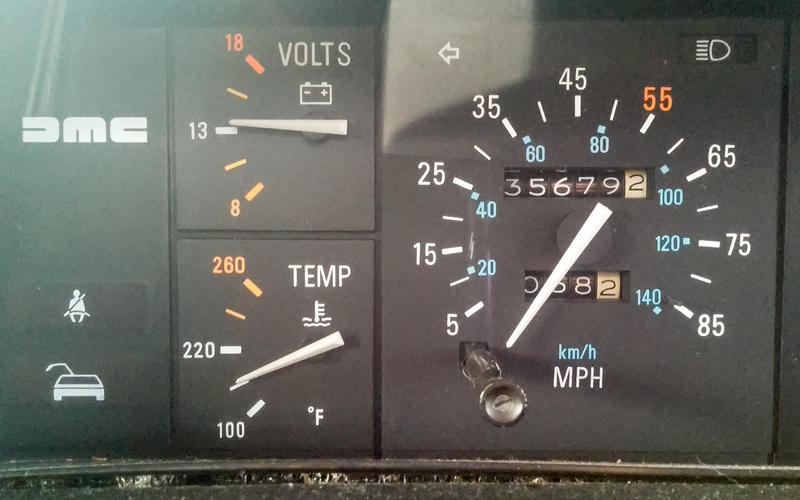 All that work and the voltage gauge needle’s barely budged! On a whim I checked the positive voltage at the electrically-closest point to the dash I could easily access, the Service Interval Counter. It measured 14.40V, which at the time was only ~0.114V voltage drop between that point & the battery. So clearly thems electrons are getting at least as far as the Service Interval Counter unhindered, and they should be able to leave unhindered through the new ground wires. I’ve checked/replaced/upgraded around 90% of this circuit, so the problem has to be somewhere in that last 10% containing the voltage gauge itself and the wires directly to and from it. This hasn’t been waste of time, though. My fuel pump now has a much better electrical connection, and it’s now running very audibly quieter due to its higher, more normal operating voltage. So quiet in fact that I can now barely hear it, which is also due in part to the new RPM Relay and better connections I’ve recently cleaned up in the electrical compartment. This means it should last longer, and my engine should receive a higher fuel pressure under heavy load, giving it a little more oomf. But better reliability is the main benefit, and in this car that’s always a good thing. It also means that since this change did little to improve the dash voltage, the rest of my grounds are already working perfectly with no corrosion slowing them down, so in a way that’s another big plus. I’m almost there to solving this problem!